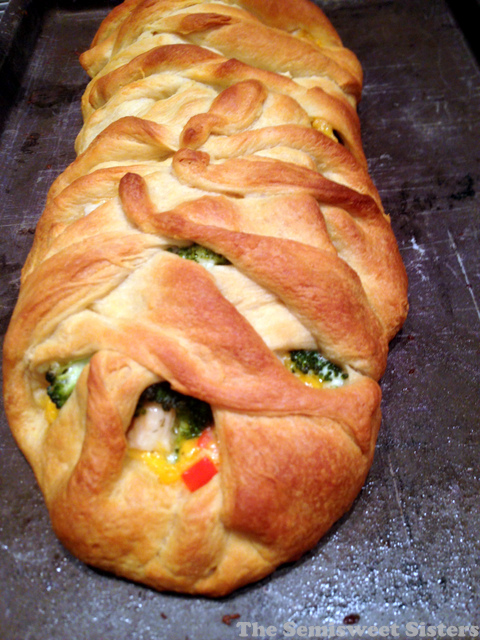 This is another recipe that is from my old mom’s group (MOPS), it’s pretty close to the Pampered Chef Chicken Broccoli Bread Recipe. This is also in my husband’s top 5 favorite meals, but the funny thing is I hardly ever make it. I have no idea why either since it’s really easy to make and I like it too. My braid doesn’t usually look too pretty, I need to watch a YouTube video on how to make it look better. 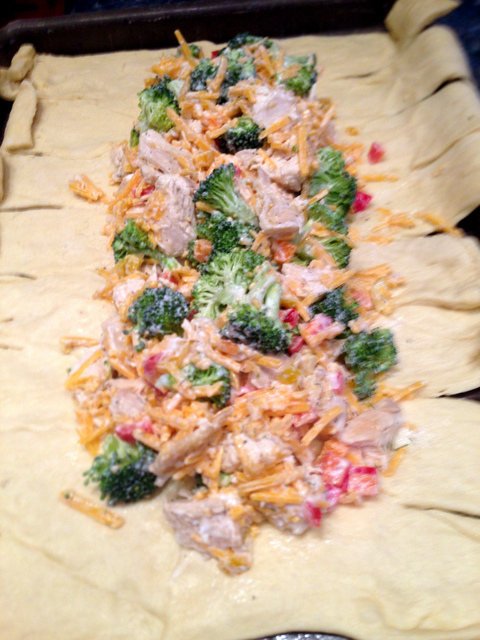 Place Chicken, broccoli, bell pepper in mixing bowl. Add garlic. Add shredded cheese and mix. Add mayonnaise, dill, onion, salt then mix. 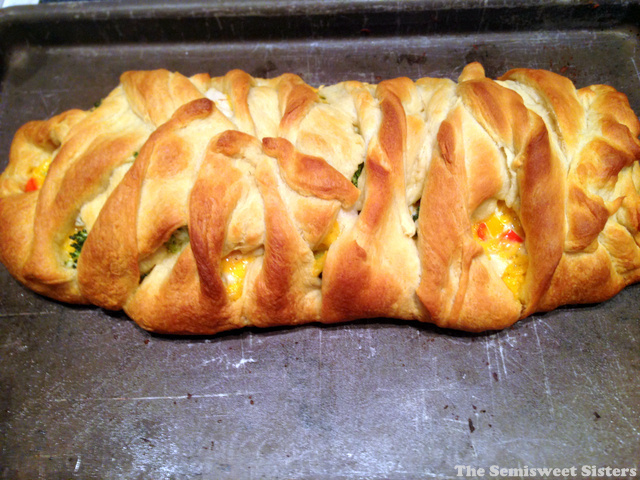 Unroll crescent rolls but do not seperate. Place both packages of rolls on a baking stone or cookie sheet end to end. Press ends together to form one long sheet of dough. Press all seams together. Along outer side of dough, along each of two opposite sides, cut 2 inch strips from end toward center. This will look like fringe along the two longer sides of the dough. Add filling down the center. 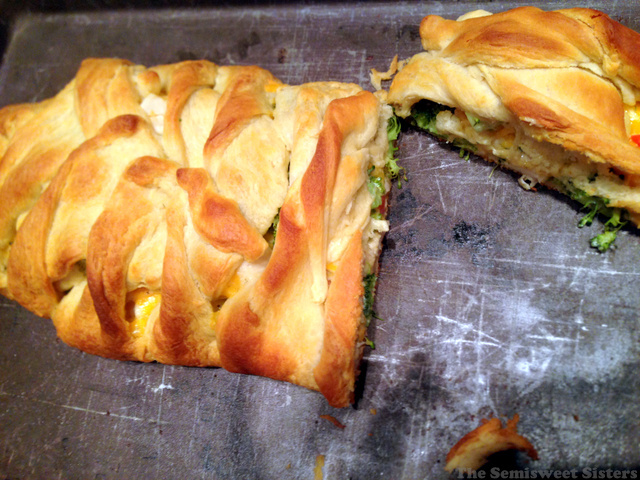 To braid, lift strips of dough, one at a time, across mixture tomeet in center, twisting each strip one turn. Continue alternating strips to form a braid. Tuck ends up to seal at end of braid.